Note: The Collector’s Cabinet is the new paperback version of Allum’s The Antiques Magpie. Smart name change if you ask me. If you have that one, you have this one. I’m on holiday. I am so on holiday that I am literally reviewing this book on the beach with the Κρητικό Πέλαγος lapping at my toes (photo provided below as proof). 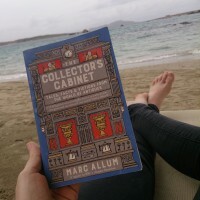 The Collector’s Cabinet by Marc Allum is my light holiday reading. I totally dig the premise of this book. 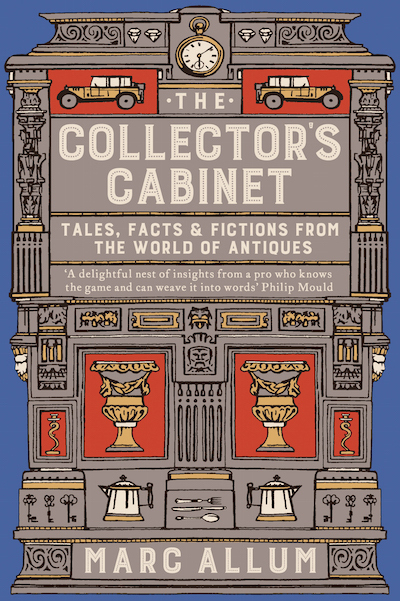 It is a textual cabinet of curiosities curated by the author: 99-ish bits and bobs. 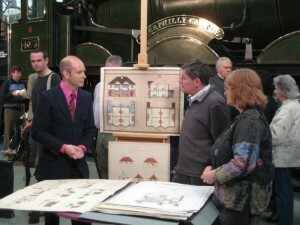 Vignettes of interesting things, paragraph or two each, all themed on some aspect of collecting. Lists of -isms. A gemstone acrostic jewelry chart. etc. Anything that Allum, veteran of the Antiques Road Show, has found interesting over the years in brief notes, often with links and hints at how to find out more. It has halfway inspired me to make my own textual cabinet of curiosities. Then again maybe that is what this website is. This really is a good vacation book. Because each section is self-contained and super short, you can read two or three, be distracted by the view for a while, read another, look at some kittens walking by, read two more, get worried when a dog falls into the harbour (don’t fret, a lady pulled him out), and then read however many it takes for you drift into an afternoon siesta under a beach umbrella. Allum takes some very important things seriously. He flat out says that just because you might want to collect it and just because someone is willing to sell it to you, that does NOT mean that it is legal. He talks about illicit antiquities directly, mentioning the devastation caused by looting, which is pretty remarkable given how very short these vignettes are. His stance is clear: if it is legal to collect, go for it (Allum himself mentions owning various objects made from human remains); if it is illegal to collect, DON’T GO FOR IT. 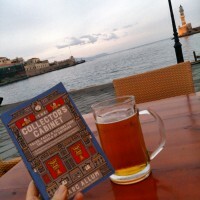 Because this book is for the average Antiques Road Show viewer, I give Allum’s care to mention illegality extra applause. I wonder if this will connect antiquities looting to the market for the first time for most readers. Oh, can I say? I love the cover. It’s spiffy but I don’t know who designed it. The front pages go so far as to mention who typeset it and in what font (Marie Doherty, Caslon), but it doesn’t say who did the cover art! I’d like whoever did this cover to do a cover for any theoretical book I produce. I particularly like one section that starts with “How can you impress your friends with your exemplary knowledge of Greek vase shapes?” How indeed! My knowledge of them IS exemplary, but the same is true for my archaeology friends. They aren’t likely to be very impressed. The section ends with a few sweet pages of line drawings of vessel forms. I very much recommend this. This exactly. 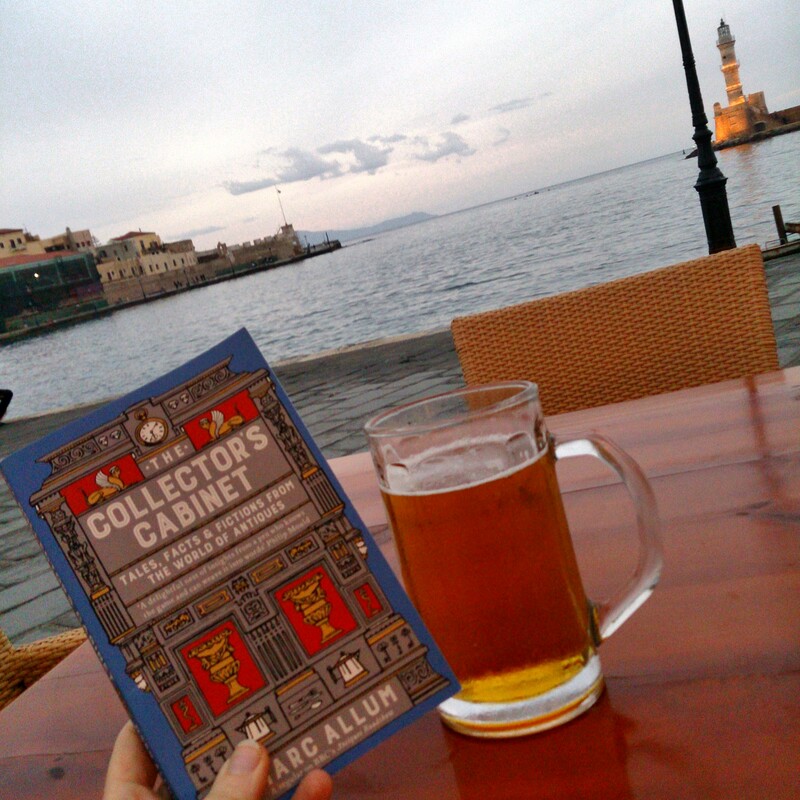 Reading by the sea in Crete. 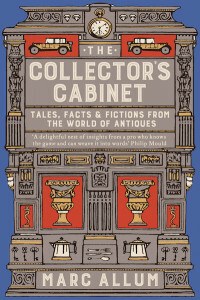 Should you read The Collector’s Cabinet? Sure. Save it for when you want to be amused enough but don’t want to try too hard. Really, these are just little surface stories but interesting ones. I can see myself giving this book to a non-specialist friend or family member as a bit of a conversation starter. If anything in there catches their fancy, I can give them (LOADS) more info. 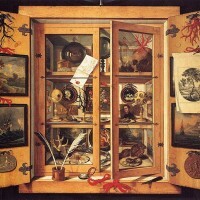 And why not collect your own written cabinet of curiosities while you are at it? The facts, figures, and “how about thats!” that YOU like. Write them down in a notebook or, heck, a blog. I bet your collection will grow and grow and will house amazing things.